The visitor to Budapest is rewarded by a number of opportunities to inspect the remains of the legionary fortresses. 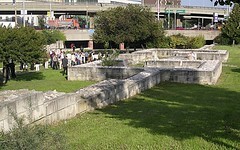 The southern gate (porta principalis dextra) is displayed in a public park, along with some of the adjacent interior buildings (image from Wikimedia Commons), including part of the centurions' quarters of the first cohort barracks to the west of the street and a portion of one of the tribunes’ houses to the east (image M. C. Bishop). Part of the fortress baths (the thermae maiores) is preserved beneath the flyover system, whilst the east gate (porta praetoria) is also consolidated and can be examined (image from Wikimedia Commons). Extramural structures include the fortress amphitheatre and a number of structures from the civil settlement preserved around the Aquincum Museum, which contains much material relevant to the fortress, notably an exterior lapidarium.